I heard about vision of the world that works for everyone is the world whereby educated and uneducated people can relate to issues that affect them on daily basis. The world whereby social networks empower the youth instead of exploiting them and television shows are less drama based instead of advocacy and educational background. The world where parents can expect more from their children without making choices for them, parents can teach their children of news, reading and speaking their views without society judging them. Most problems facing the world today are politics as every year one country or more the whole world get(s) to be politically unstable, teenage pregnancies due to myths, peer pressure and sexually based television programs, unemployment yet every year there are high numbers of graduates from high level of education institutes who get to sit down as there are no jobs and people end up going to school again as a way to avoid unemployment. Climate changes is one of the pressing matter in the world, one cannot plant crops without worrying if they will die or survive as the weather fluctuates every now and then. Other world pressing matters are high school dropouts, drugs, HIV/AIDS, cancer and antibiotics that lose their efficacy. All these problems could be solved with the world working as one in matters that affect them in general despite their financial statuses, implementing laws which both the governments and society in general have a say in especially in climate matters, removing old people in power since most are less ambitious and have personal interests at heart instead of the country’s interests, putting more effort in sustainable development goals by teaching about them not just at high education level and also at basic education level, teaching parents how to approach and talk about sensitive matters to their children, appreciation of science and technology and adaptation and changing with technology as it moves with centuries. Teaching young kids about importance of being tomorrow’s leaders, importance of books, learning in general so they grow up having more interest in becoming better people not being more concerned about social networks and empowering women into power and technology. I am a Mosotho woman who has spent most of my life in the highlands of Lesotho, I am a single mom to a 2 years old girl (Thea). I have three siblings, a brother (27), and two sisters (10 and 6). Ever since growing up I have been more of a reading person than a sports active person. The books I have read include pacesetters (written by African authors), baby books like Cinderella, Winnie the Pooh, The Bear Family. The Secret by Rhonda Byrnes, It’s Obvious but not Simple by Jim Dornan, The Tipping Point, The power of positive thinking and many other more pdfs and hardcopies that inspire and help a person grow in all aspects of life. My favourite movies include War Room, Like Stars on Earth Three Idiots, I am not Ashamed, Numbers, The Fast and Furious, The Transporter, WWE stars movies, Think Like A Man etc. and I enjoy watching series a lot examples of those I have watched include Revenge, Grey’s Anatomy, Major Crimes, Criminal Minds, Suits, Scandal, The Blacklist etc. I love pop music, country, club music and a little bit of hip-hop. I enjoy watching motivational videos and listening to their audios. At high school level I engaged in AIDS club, debate club and I used to have a pen pal from Wales since my high had a very good relationship with one of the schools in Wales. 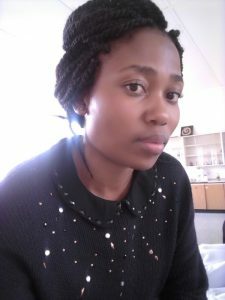 I studied Biology and Chemistry because I am interest in doctorate and science in general and I would also like to pursue my studies further by doing MSc programs in either public health or biomedical sciences. I have attended a photography session held by one German cooperation as I have interest of travelling one day and I want to believe photography plays a very important role in adventure. Recently I have started learning Spanish through some phone app called DuoLingo and I have been watching YouTube videos and following them. I think learning others languages offers one an opportunity in travelling connecting with other cultures. Other languages I would love to learn are French, Afrikaans, Zulu and Korean. I dream of having a stable, happy and peaceful home one day and being to inspire my daughter, sisters and everyone around. I have a strong desire of touching people’s lives and having good relationships with all communities I engage in. Helping others is one thing I desire not to get credit as such but in life we need each other to grow and I want to do something that will make me proud and feel good about myself as I go to bed at the end of the day. Volunteering as a peer educator (teaching comprehensive sexuality education to out of school) has taught me that tomorrow’s leaders are not only those in class and who have a certification instead everyone can do it so long as they believe in themselves. I believe in dreaming as way of getting the life I desire and I am the type to write things down, be it thoughts, hopes, dreams, goals and I love working with the less privileged since I know what it’s like to be in their shoes.